iOS 11 releases on Tuesday, September 19, bringing a load of improvements to your iPhone and iPad. One highly touted feature that won't make tomorrow's release, however, is Apple Pay's new peer-to-peer payment system. 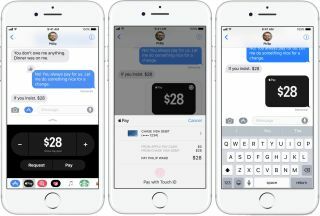 Apple announced in a blog post on Monday that Apple Pay Cash, which lets users send and receive money from friends and family, will release in the fall, missing tomorrow's iOS 11 launch date. This likely puts Apple Pay Cash's arrival sometime between October and December. Apple Pay Cash is due to launch in the US; Apple hasn't said when the feature will make it to other markets yet. An update to iOS 11 and watchOS 4 will bring Venmo-like, person-to-person payments to the iPhon, iPad and Apple Watch, Apple said. It's then users can pay back friends / get paid back via iMessages and Siri. Also arriving in the fall is indoor maps in Apple Maps, helping users navigate through airports and shopping centers. Airports where indoor mapping will be available include Amsterdam (AMS), London Heathrow (LHR), Las Vegas (LAS), Los Angeles (LAX), Miami (MIA), Philadelphia (PHL) and San Jose (SJC). What will arrive when iOS 11 launches tomorrow? Here's a taste: augmented reality thanks to ARKit, a more natural Siri, the redesigned App Store, boosted photo features, and loads of iPad improvements.